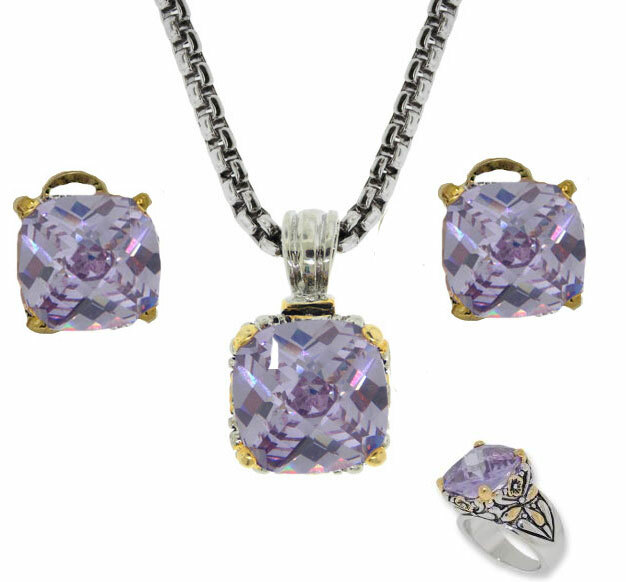 Best Selling High Fashion Lavender Light Purple Pendant, Ring & earrings now come in sets at a discount, lovely wholesale set is rhodium plated; this fine jewelry set is accented with a Cushion cut Swarovski CZ in a designer style Jewelry has a detailed woven design around the sides and is accented in 18kt heavy gold plate; it is fully finished on front and back. The stone measures 5/8" long and comes on a 16" adjustable fancy designer chain, with a 2 "extension, the enhancer opens and can be worn on pearls or other chains. The earrings have an omega clip; Search 711 for matching jewelry from this collection of high quality jewelry and to buy these items singularly and, comes in Red Faux Leather Classic Collection Jewelry Gift Box 3 1/2 x 2 3/4 x 1. This box makes a striking presentation. Red faux leather with gold-color filigree borders covers; interior includes a velvet insert and satin lining. Each box is delivered in a high gloss white box, very high end box with snap closure.